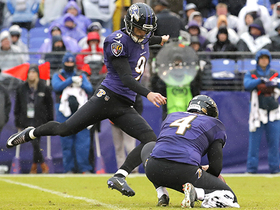 Analysis: Another strong season netted Tucker a first-team All-Pro nod and kept him cemented as one of the elite kickers in the NFL. He connected on five kicks of 50-plus yards and has now made at least 30 field goals in four straight seasons and six of his seven seasons overall. Tucker will enter the final season of his four-year, $16.8 million deal with the Ravens in 2019. Analysis: Tucker's line was deflated by a series of long kicks against Los Angeles. He missed a makable 53-yard attempt and a 65-yard prayer as time expired in the first half. He did manage to connect from 56 yards and on his shorter attempts. He's hitting on 89 percent of his field goals this season (31-for-35) and continues to be one of the best fantasy options in the league at his position. Analysis: Tucker converted field-goal attempts from 24 and 35 yards out. He improves to 28-for-30 on field-goal attempts this season -- fifth-best percentage in the league for kickers with at least 20 attempts. Analysis: It was a typical day at the office for Tucker, who is now 26-for-28 on the season. Tucker's six points ended his streak of four consecutive games with at least 10 points, but that is more of a product of opportunity than anything else. The 29-year-old has used this season as a platform to unequivocally prove he still has plenty left in the tank. Analysis: Tucker logged an outstanding fantasy outing Week 13, accounting for more than half of Baltimore's total points. He has not missed a kick since Week 7. The 29-year-old remains one of the top fantasy options at his position heading into a Week 14 tilt against the Chiefs. 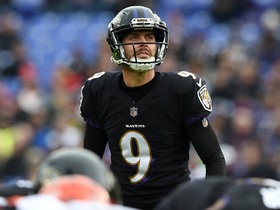 Analysis: Tucker has kicked at least two field goals in three straight games and remains a pillar of stability in Baltimore's offense despite questions at the quarterback position. He'll look to log another strong outing against the Falcons on Sunday. 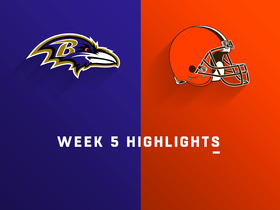 Tucker converted all three of his field-goal attempts and made his only extra-point try during Sunday's win over the Bengals. Analysis: Tucker logged his third consecutive perfect game, including a long field-goal try of 56 yards. The talented kicker accounted for 10 of Baltimore's total points during Sunday's 24-21 win against Cincinnati. He'll look to log another strong outing against the Raiders in Week 12. 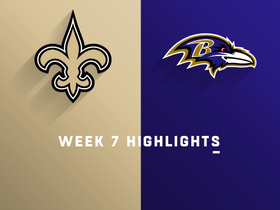 Tucker converted all three of his field-goal attempts and his lone extra-point attempt Sunday against the Steelers. Analysis: Tucker was perfect on the day, converting two 23-yard field goals and a 37-yarder. He is tied for seventh in the league with 16 made field goals through nine weeks, and his 88.9 percent conversion rate ranks 12th in the league. Tucker is on a bye before returning to action Nov. 18 against the Bengals. 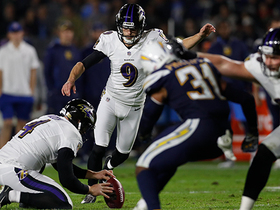 Baltimore Ravens kicker Justin Tucker's onside kick goes directly to Los Angeles Chargers wide receiver Keenan Allen. 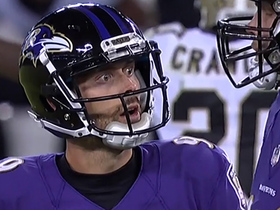 Baltimore Ravens kicker Justin Tucker nails a 56-yard field goal. 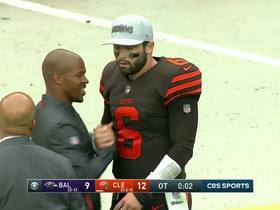 NFL Network's Tom Pelissero reports on Baltimore Ravens kicker Justin Tucker's simple reaction to not being selected to the Pro Bowl. 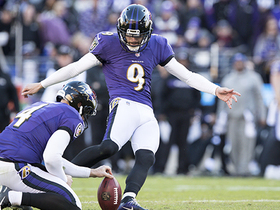 Baltimore Ravens kicker Justin Tucker makes a 47-yard field goal. Baltimore Ravens kicker Justin Tucker rockets 56-yard FG through the uprights to close out first half. 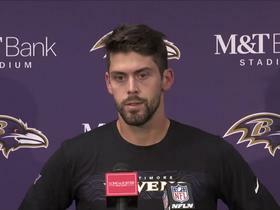 Baltimore Ravens kicker Justin Tucker reacts to first missed extra point of career. 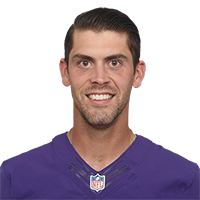 Baltimore Ravens kicker Justin Tucker misses his first extra point of his career as the Ravens could have tied the game on the attempt.